In this book, Stephen Mitchell has selected and adapted the fifty greatest Psalms from the Hebrew Bible. Some of his versions are fairly close translations, but he has also paraphrased, expanded, contracted, deleted, and freely improvised on the themes of the originals. As in his widely praised version of the Book of Job, Mr. Mitchell has here recreated the dense, supple music of Hebrew verse. The result is that for the first time the Psalms truly sing in the language of today. The Hebrew word for psalm is mizmór, which means a hymn sung to the accompaniment of a lyre. But when the ancient rabbis named the anthology that we know as the Book of Psalms, they called it séfer tehillím, the Book of Praises. That is the dominant theme of the greatest of the Psalms: a rapturous praise, a deep, exuberant gratitude for being here. The mind in harmony with the way things are sees that this is a good world, that life is good and death is good. It feels the joy that all creatures express by their very being, and finds its own music in accompanying the universal rapture. let the trees of the forest exult. The praise is addressed to whom? to what? When gratitude wells up through our whole body, we don’t even ask. Words such as God and Tao and Buddha-nature only point to the reality that is the source and essence of all things, the luminous intelligence that shines from the depths of the human heart: the vital, immanent, subtle, radiant X. The ancient Jews named this unnamable reality yhvh, “that which causes [everything] to exist,” or, even more insightfully, ehyéh, “I am.” Yet God is neither here nor there, neither before nor after, neither outside nor inside. As soon as we say that God is anything, we are a billion light-years away. In the following adaptations, I have called God “him” for lack of a better pronoun. You should, of course, feel free to substitute “her” if you wish. “Sing to the Lord a new song.” My primary allegiance in these psalms was not to the Hebrew text but to my own sense of the genuine. I have translated fairly closely where that has been possible; but I have also paraphrased, expanded, contracted, deleted, shuffled the order of verses, and freely improvised on the themes of the originals. When I disregarded the letter entirely, it was so that I could follow the spirit, wherever it wanted to take me, into a language that felt genuine and alive. The Psalms speak as both poetry and prayer. Some of them are very great poems. But as prayer, even the greatest poems are inadequate. Pure prayer begins at the threshold of silence. It says nothing, asks for nothing. It is a kind of listening. The deeper the listening, the less we listen for, until silence itself becomes the voice of God. and no longer nourish illusions. and keep their hearts open, day and night. which bear fruit when they are ready. Their leaves will not fall or wither. Everything they do will succeed. I praise you for that which is. or close myself to this anguish. and I ask to receive it as your gift. greater than all the world’s riches. for I know that even now you are here. and creates the world with each breath. in the silence beyond all thought. in the depths of the listening heart. and my heart has satisfied its longing. or anything that is not you. like a child at its mother’s breast. sleeping in its mother’s arms. you are closer to me than my thoughts. that you do not know completely. and you hold me in the palm of your hand. so deep that I cannot fathom it. and your spirit will give me strength. and my heart rejoices in your joy. woven in the depths of the world. How can I keep from praising you? and all your works are marvelous. before even one of them was. and is vaster than space, than time. the grains of sand on a beach. to the depths of my inmost heart. and lead me in eternal life. 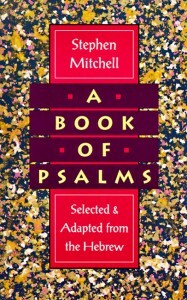 I’ve been referring to Stephen Mitchell’s A Book of Psalms, citing them, teaching them, giving copies to special friends. I like, first, the voice, fresh, sparkling, clear, and one that merges happily with the psalmist’s voice; the wisdom — the sense of transience, of being here fully in the moment — all of it imparted with such joyful innocence, and so simply, that one is not immediately aware of its true depth. This is a noble work, and one to make Mr. Mitchell proud, now and for years to come. 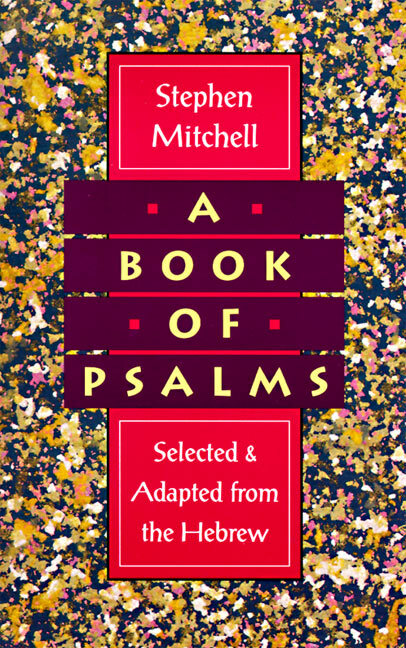 Mitchell has responded to the old poems with a contemporary spirit that values peace, economic and political justice, and personal integrity… He has so well succeeded in his restorative task that he makes our delight in praising God through the Psalms seem not dutiful but inevitable.